Reluctantly, you press publish, and hurl your mass of mediocrity out into the abyss of cyberspace. Now, you need to promote what you wrote. People aren’t going to just stumble on it like they did a few years ago. After thorough reflection on the stirring prose you have just created you decide to take a nap for a while. If you want to write good posts that people will read, you’re not going to get it done this way. You can’t bang out a great blog post at the last minute. You won’t get the quality that you need to keep people engaged. And because you know your post is mediocre when you finish writing it, you are not going to put the required effort into promoting it. You need a plan to help you write better and to create engaging content that people will read. So, here are some pointers that will dramatically improve your content. Don’t just sit down at your computer at start trying to write a blog the day its due. (You do have a regular publishing schedule, right?) Take a day, well in advance of your deadline to brainstorm 100 or more blog titles. Try creating a mind map of your subject area to help generate more ideas. When thinking about titles, you will likely start with topics. Topics are very broad and too general to make a good blog post. For an actual post, you should go an inch wide and a mile deep. 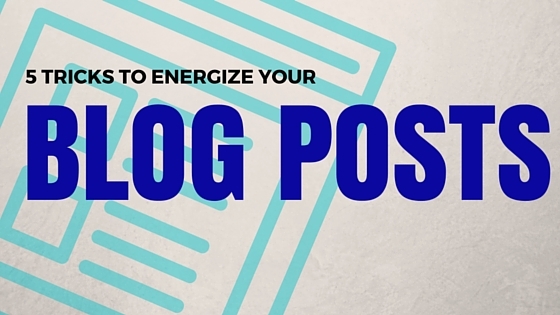 “Writing Good Blog Posts” is a topic. A narrower topic is “Creating Great InfoGraphics for Your Blog”. How about “How to Create InfoGraphics using Cartoons” as a blog post. Consider making one pass creating broad titles – then make a second pass trying to create more specific titles that could fit in that topic area. By working out your subjects in advance, you will also have more time to collect up and organize the information. You won’t write about “Five Experts Share Their Tips for a Better Blog” if you have to bang the post out in two hour. You will be lucky if you can get a hold of one expert in that much time, much less five. Quite simply, if you have several posts in the works, you will have time to do do the necessary research, create images or info-graphics, and take any other required action to do them well. Now you’ve got some great ideas to write about. How can you keep your readers engaged and reading? One of the best ways is to draw them into a story. Don’t just offer the solution, tell them about someone who faced the problem and how they solved it. Or, write from their point of view. When your done, you have to feel like you have engaging content that other will want to read, or you won’t be able to get up from your nap to promote it. Now, hopefully you’re writing better stories than I do. But don’t worry, they more you write the better they will get. what else can you do to keep your reader engaged? People don’t read on the Internet, they scan. The average reader – your reader – is very distracted, so make it easy for them to scan your post for a quick overview or to find some portion of your post that strikes their curiosity. If they all can see is a large block of text without any sort of a road map or outline, they will probably just to back to their search results and click on something else. Subheadings make your posts more readable. Your readers will most likely scan your post quickly before deciding to dig in deeper. You need to guide them through the content with well chosen headings that breakup and outline the content. You know those titles that you just have to click on? “5 Tricks to Lose Weight Fast (Number Three Will Shock You)” They create a feeling of intense curiosity that almost forces you to click on the heading. They are called clickbait and they are great headlines to get people to start reading your content. Use them, but beware: make sure the headline is accurate. You risk upsetting and alienating your reader when they get to number three and aren’t shocked. If you disappoint your readers, you’re going to lose them. Now that you’ve drawn your readers in with a story and lead them through the story with well placed titles, what else can you do? Try adding graphics to further break up the text and make it more visually appealing. Well established bloggers all use a featured image in their posts. Additional graphics will make your posts interest your readers even more. For example, a bar graph quickly conveys much more information than a table. Graphs and Info-graphics are a key tool for helping your readers absorb the information in your post. Currently, I use Inkscape and OpenOffice Calc to create graphs and info-graphics. This is an area that I’m exploring though. Now that you’re planning your posts in advance, telling stories, outlining your stories with cleaver headlines and adding graphics, your posts will be much more worthy of promoting. Hopefully you won’t feel the need to nap after your posts are done any more. What do you think of this post? Did you find any ideas that will help improve your blogging? What are your biggest challenges you face in trying to create your blog content?